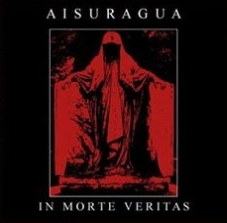 Aisuragua are a solo project from Spain that has had an album reviewed before in this zine and on this recording plays a very depressive and primitive form of black metal and this is a review of his 2018 album "In Morte Veritas" which was released by Hidden Marly Production. A very dark sounding intro starts off the album along with some drones and ambient style synths while programmed beats are also used at times before going into a heavier musical direction and when the music speeds up a great amount of blast beats and tremolo picking can be heard which also gives the songs more of a raw feeling. On this recording Aisuragua moves away from the dark ambient style of his previous recording and returns to his black metal roots by creating an album that is very depressive but on the more raw side as opposed to the atmospheric side that most modern bands go for, the production sounds very dark and raw while the lyrics cover depression, misanthropy, existentialism, landscape and cosmos themes. In my opinion this is another great sounding recording from Aisuragua and if you are a fan of raw and depressive black metal, you should check out this album. RECOMMENDED TRACKS INCLUDE "The Day Of Blasphemy" and "My Pilgrimage Is Over". 8 out of 10.